From Dublin, Tina graduated from St. Angela's College of Education for Home Economics with an honours B.Ed degree in Home Economics and Science (1990). Tina spent a number of years teaching H.E, Science and was Transition Year co-ordinator. 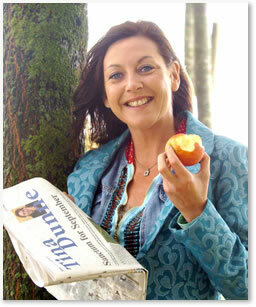 Tina then became Food Advisor at Bloomfields Food Hall in Dun Laoghaire, Co. Dublin. Tesco - Ireland's flagship store at that time. Leading a very innovative and forward thinking Food Team. Demonstrating tremendous initiative and leading the way in Ireland, using fresh ingredients to create recipes and menu plans. Targeted at stabilising and improving health and encouraging a new approach to 'in- store' shopping regarding fresh food, diet and well being. Inviting chefs from well-known Restaurants in Ireland and celebrity Chefs such as Ken Hom to demonstrate their terrific culinary skills - creating a public platform for improved Lifestyle awareness. In September 1998, Tina travelled to South America to research a number of Foods and Wine related projects for a number of companies. She also studied Natural Nutrition and Colour Therapy before launching her Lifestyle Company in 2003. Which offers organisations and industries an extensive range of services in Nutrition and Marketing Communication. Tina also runs a successful Lifestyle / Cookery Programme for Children and Teenagers.